Prophetika e Saturnia: essenziali per collezionisti e appassionati di Sun Ra!!! 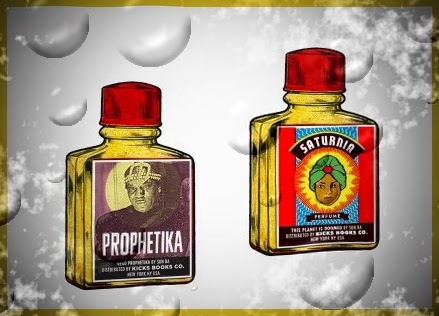 Prophetika Perfume's ancient formula invokes a mirage of memories and mysteries and incites a call to action. Hints of Cairo and Chicago -- and Casseopia! Saturnia Perfume is created from the highest quality Neroli distillate of bitter orange blossoms. Native to the Far East and cultivated in Egypt, Morocco, and Tunisia, this heavenly scent stimulates the brain waves and works well as an Afrodisiac. Note that Neroli was the seductive essence of Narcisse Noir, created in 1911, immortalized in Sunset Boulevard, and was, more importantly, singing brakeman Jimmie Rodgers' favorite fragrance. Neroli blossoms would transport Jimmie far from tuberculine huff and smokestack lightning. Now let the scent transport you out of the doom and into orbit as you ponder 'This Planet is doomed'. Saturnia was bottled during the Capricornus July full hay moon. This is the constellation that provides passage for the soul at death. Saturnia is truly... out of this world!